Obtain consent from the patient and record this consent in the patient demographic. Before a patient is able to have SMS reminders sent to them, they must have consent for SMS reminders enabled in their demographic record. Note: SMS reminders should follow your practice’s policies for telephone and electronic communications. Search for the patient using any of the patient search methods: File > Open Patient, View > Patient, or press F2. Click Edit to open the Patient details screen. Tick Consent to SMS Reminder. The mobile phone number entered must be in the Australian format of ‘0400 000 000’ (with or without spaces). The number must not have a ‘+’ or ‘61’ prefix. Incorrectly formatted numbers will be rejected by the message provider service and will not be delivered to the patient. 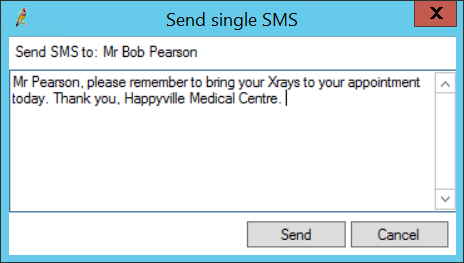 To send a patient a single SMS reminder, the patient must have an appointment in the appointment book. 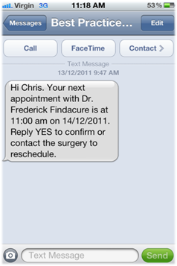 Select the patient's appointment and select Utilities > Send single SMS from the menu. The Send single SMS screen will appear. Type in your message and click the Send button. The SMS will be sent immediately. You can check replies to single sent messages. From the appointment book, select Utilities > Send SMS Reminder. The SMS Reminders screen will appear. After you have selected the criteria, any patients who have appointments that meet the criteria and have Consent to SMS reminders enabled in their demographic will appear on the right hand side of the screen. Select an SMS template other than the default if you need to. Tick the checkbox of each appointment you want to send an SMS reminder for. Click the Send all Reminders button. If there are no duplicate SMS reminders, the SMS messages will be sent. 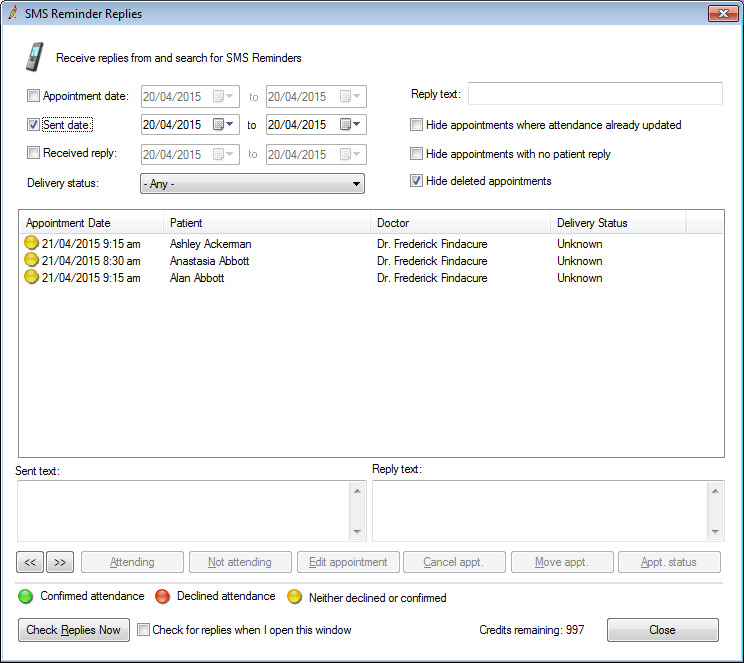 Where a patient has multiple appointments in the selected range or there are multiple patients who have the same mobile phone number, a Duplicate SMS Reminders screen will appear. 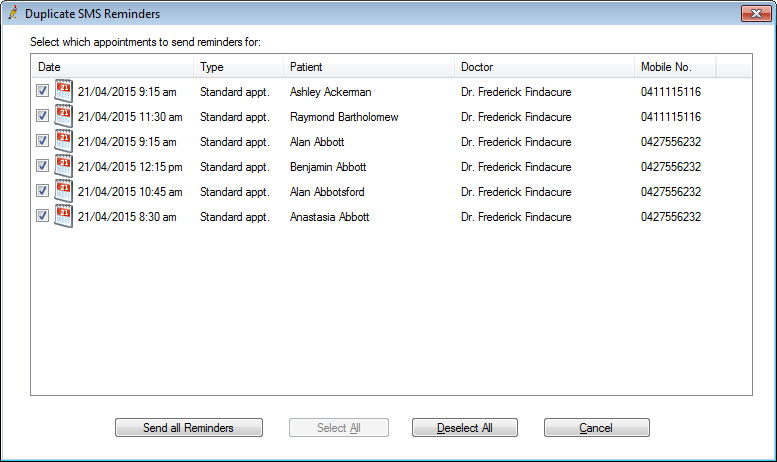 This screen shows each appointment that would generate a duplicate SMS. Untick the appointments that you don't want SMSes sent for and click the Send all Reminders button. 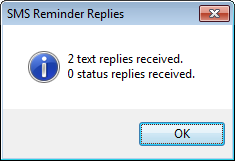 To check replies, you must enable the Check for replies to SMS Reminders option when configuring SMS reminders. From the appointment book, select Utilities > Check SMS Reminder Replies. The SMS Reminder Replies screen will be displayed. the text that was in the reply. Hide deleted appointments removes deleted appointments from display. The middle section of the screen shows the SMS reminders. Select a message to see the text of the SMS reminder and the reply message text. Click Check Replies Now to check for any new replies that have been received. Tick the checkbox Check for replies when I open this window to save having to remember to press this button each time. If your system is configured to Automatically confirm or decline appointment attendance when the patient replies ‘YES’ or ‘NO’ to SMS reminder, Bp Premier will automatically update the status of an appointment. Click Close to close the reminder replies screen. A green circle icon means that the appointment has accepted. A red circle icon means that the appointment has been declined. A yellow circle icon means that they have been sent an SMS reminder but have not accepted or declined. 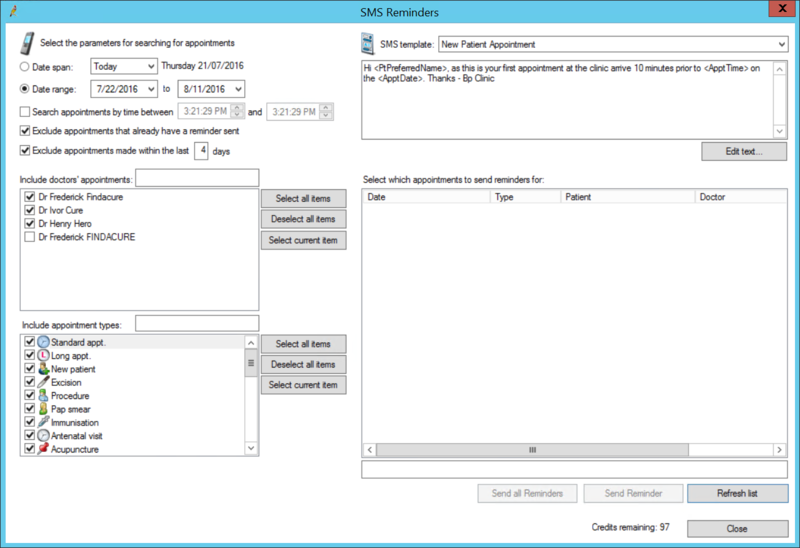 You can manually update the appointment and appointment attendance using the SMS Reminder Replies screen or the Appointment Attendance screen.